The Thermwood QCore SuperControl is a feature rich, high performance CNC control system. Thermwood, the only major CNC router manufacturer that designs and builds its own CNC control, is a leader in implementing advanced control technology. As a result, Thermwood has been granted more patents on CNC router technology than all other CNC router manufactures in the world, combined. This control is designed from its very core to operate a CNC router with efficiency and higher productivity. It is a fully multitasking control utilizing a quad core processor. It features a high level of hardware integration, extensive use of reliable surface mount technology and a built in upgrade path for future technology. Thermwood’s QCore SuperControl currently incorporates more advanced control features than any other CNC control in the woodworking industry. As well as, trims formed parts or machine patterns or molds using full five-axis simultaneous motions within the thermoformed,composite and fiberglass applications. And, because Thermwood controls all the technology, you have single source responsibility. Thermwood stands behind and supports the entire system and when new technology comes out it can easily be upgraded. The QCore SuperControl is equipped with a 19” full color LCD flat screen monitor and 1 TB hard drive. With the huge program storage capacity, programs can be stored and excuted with no delays. Complex CAD generated programs can be excuted at high speed without stopping. The control uses a Microsoft® Windows® 10 Professional operating system, offering the operator choices for program and machine operation display, popup windows for event and information display, pop-up windows for data input, and the ability to operate the machine in the background while doing other tasks on the control. The QCore SuperControl can also create programs directly at the machine with a newly designed Hand Held Programmer. Good quality first generation controls provide for lead screw compensation, that is, they use a table to compensate for any position inaccuracy along an axis. The table is created by measuring precise actual position along an axis using a laser. The only problem is that moving along one axis may cause inaccuracies on the other two perpendicular axes. Any slight mechanical variation or natural flex can cause these movements and there is no way to eliminate them through mechanics or structure. First generation compensation only corrects pitch error on each axis, ignoring any effect on the perpendicular axes. Next generation controls compensate all three axes at every position within the working envelope. Every inaccuracy or misalignment, regardless of its source, is automatically corrected. First generation controls are primarily playback devices, much like a player piano. They require that the programmer not only design the part but also perform a series of additional functions including CAM, nesting, and post processing in order to generate a precisely formatted program that the control can execute. 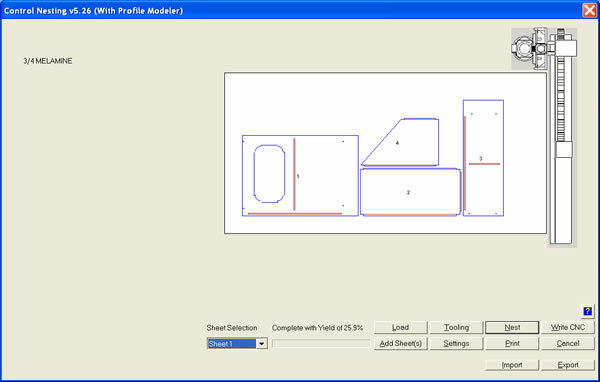 Next generation controls such as Thermwood’s QCore SuperControl can, in addition to standard CNC programs, also accept raw design files directly from design software without the additional processing. It automatically performs any program preparation necessary to machine the part. The control creates nests of parts internally and can combine parts from multiple sources in the same nest. Including all the parts for a job in a single file can dramatically reduce file handling and improve productivity of the machine. The control nests the parts on the appropriate material, tells the operator how many sheets of material are needed for the job and tells him what material to load. In fact, it guides him through the entire process, step by step. This file also contains information for machining the back or flip side of certain parts. It prints a label for each part. Parts that require flip operations have a bar code on the label. When the operator scans the bar code, it identifies the part to the control which automatically retrieves the correct program. From the operator’s standpoint the whole process is simple, load one file and follow instructions. In a first generation control, the CNC programs are developed outside the control, so there is a program file for each sheet of material in the job and yet another program file for each flip operation. These files are normally processed into individual CNC programs. A single job may require a hundred files or more that must be sent individually to the machine. Some really limited controls may only allow one, or maybe a couple of programs to be loaded at a time. An operator then needs to sort through, identify, handle and load hundreds of files each day. This takes time and reduces productivity of a major investment, the CNC router. Also, this approach is more prone to error. For example, if you have a damaged sheet or a partial sheet of material, it is easy to tell the control what you have and it will nest on it. If the partial sheet is from a previous job, it is not even necessary to provide a description to the control. The control prints a bar code label for any material left from a job and all you need to do is scan that label. Theoretically this is possible with a first generation approach but from a practical standpoint, most times you don’t know exactly what you have until you are ready to run the job. Changes are easy at the control with little delay to the job but that’s usually not a good time to stop everything, go back to the office to re-program. When you have a design with a profile edge, there are two ways to cut the profile.The most common way is to have a cutting tool made with the desired profile. A second, less known method is to model the profile. 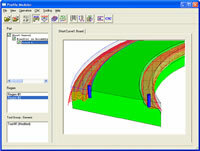 Modeling is a technique commonly used to make prototypes or patterns from CAD designs. It uses a series of standard tools. The process begins by moving a ball nose tool back and forth over the surface, incrementing a small distance each pass. This creates the base surface of the part. Then a second and perhaps third tool are used which machines away those areas that the first tool could not reach. With the higher speeds of today’s CNC routers, modeling is practical for short run production parts but does require a modeling program. Most CAD systems can create modeling programs but seldom are used for this purpose. Thermwood’s QCore SuperControl has the ability to create these modeling programs, automatically right in the control. If you send a part with a profile edge to a QCore control, it asks if you have a tool for the profile. If you say no, it automatically creates a modeling program to machine the edge. This simple feature can be incredibly useful. It can be used to machine custom profiles on parts or machine moldings, even large complex or curved moldings without special tooling. Just like fingerprints, no two CNC machines are the same. Sometimes differences are major, like different table sizes. Sometimes differences are subtle, like different head spacing. Regardless, no two machines are exactly the same so the CNC program needs to be tailored to the particular machine it will be run on. If you want to run the exact same part on different machines using a first generation control, you need to create a different program tailored to EACH machine. With first generation controls, you cannot freely exchange programs between machines. Next generation controls, however, accept design files and automatically tailor the program to produce the correct part. You can freely exchange these files between machines with next generation controls regardless of the physical differences in the machine. This is the basis for an entire Production Sharing program under which Thermwood machine owners make parts for other shops. 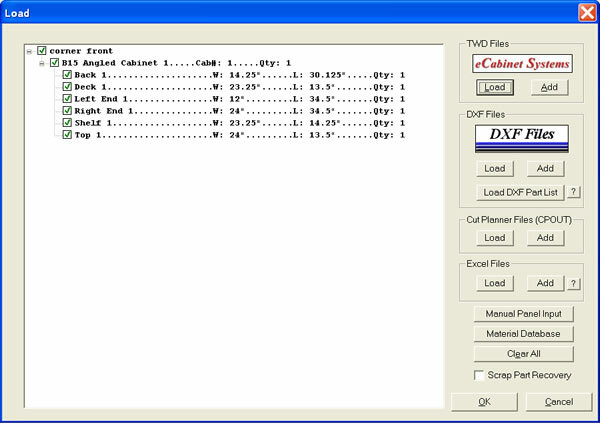 Thermwood’s control accepts either Excel or CPOUT files commonly used to send size information to a panel saw optimizer. It then nests the panels and cuts them. Since panels do not need to be lined up along common cut lines, as they do in a panel saw, they can be true shape nested, often resulting in better yield. If you just want rectangular panels, you can also just type a list of sizes at the control and it will nest and cut them. The QCore SuperControl has the ability to take door definition files from eCabinet Systems and create machine programs to make either MDF or traditional solid wood raised panel doors. Produce cabinet and furniture doors - The QCore SuperControl has the ability to take door definition files from eCabinet Systems and create machine programs to make either MDF or traditional solid wood raised panel doors. Thermwood’s QCore SuperControl includes the ability to read imbedded Advanced Function Language commands in the CNC program and reconfigure control operation based on those commands. The Advanced Function Language is a programming language, similar to Microsoft Basic that can be included in a CNC program to make it into an intelligent computer program, capable of reacting to its environment or operator input. This feature, which is intended for sophisticated users, will allow the control to address complex or sophisticated applications for which the control was not originally intended. Operating a CNC machine in the real world involves more than just running a program. It requires a multitude of disciplines including, among others, tooling, maintenance, configuration, error handling, adjustment and support. First generation controls don’t do any of this so you must handle it all yourself. This requires a high level of skill and training plus a lot of downtime as you fumble with problems. Next generation controls have systems for quickly and easily handling all this, many times automatically in the background. First generation controls are less productive, requiring more effort, more time and more training generally resulting in more downtime, missed schedules and more frustration. All these problems in an effort to save a little money and yet the difference in cost is insignificant compared to the cost of a typical CNC router. Actually, you can argue that Thermwood’s next generation control is lower cost than limited first generation controls. The lower cost comes from the fact that next generation controls perform functions internally that require separate software packages and additional steps for first generation controls. The additional software and less efficient functioning of the first generation approach are substantially higher cost than the advanced processors needed for next generation features. When you move into more advanced applications, machining complex CAD generated surfaces or three-dimensional volumetric compensation of large envelope machines, no other control can match the QCore SuperControl. It easily executes multi-gigabyte programs that choke other controls, creating complex surfaces to unheard of accuracies. There are even higher level functions reserved for highly experienced programmers and research labs to handle the most sophisticated applications. Whether you are making simple cabinets or the most sophisticated scientific project, no CNC control will outperform Thermwood’s QCore SuperControl. The QCore SuperControl has a tool management system used to define and manage tools. With the advent of automatic tool changers and random use of tools, this makes management of tooling easier and tracks tool use, informing the operator when tool life has expired for a particular tool. It can even automatically switch to a back-up tool when life expires. The QCore SuperControl tracks routine maintenance, alerting the operator when maintenance such as lubrication or filter cleaning is required. When an error occurs, the control displays a diagram of the machine pointing out possible causes for the error and suggesting solutions. The QCore SuperControl includes a complete operator’s manual that can be displayed on the screen including the ability to search for words or phrases. The QCore SuperControl will display videos that detail common maintenance adjustment or repair procedures, allowing users to perform many of these functions without outside technical assistance. The QCore SuperControl can display three-dimensional images of all machine assemblies which can be rotated and exploded on the screen. This shows customer maintenance people the assembly sequence for all components and, by placing the cursor over any part it displays the part number making it easy to order replacement parts. When a job containing a large number of parts is sent to the QCore SuperControl, it nests the parts, tells the operator the number of sheets of each material needed for the job and guides him through the job step by step. Using the Virtual Service communications link allows a Thermwood technician to access all the data, error logs and configuration files that he could access if he were actually at the machine. Using the Virtual Service communication link the Thermwood technician can evaluate machine performance, then adjust and reconfigure the machine as required, all remotely. Most machine problems are caused by programming errors. The Virtual Service communication link allows a Thermwood technician to review, and if necessary modify programs working directly with the customer. Using the Virtual service communication link a customer can purchase spare or replacement part right through the QCore SuperControl. Rugged ABS case with rubberized sure grip sides. LCD sunlight readable screen display. Durable 24-key steel-dome membrane keypad. Direct feed rate override % control. Instant zero feed rate % button. Power feed positioning at current feed rate until button is released. Pulse/move an axis at a set increment for fine positioning. Power pulse an axis for fine positioning until button is released. Scroll through part program lines/blocks to view any line. Current feed rate is always displayed on teach screens. Current pulse increment is always displayed during line/ motion teach. You can toggle the program display on all Thermwood controls from the cryptic “M” and “G” code, EIA designators to an English language description of each line in the program. This greatly simplifies operation and learning for people not familiar with CNC code. Certain materials such as high pressure laminates and certain types of plywood with abrasive adhesive between layers will quickly dull tooling at the point or points where the tool contacts the abrasive layer or layers. The QCore SuperControl has a feature which oscillates the tool up and down as it cuts to move this abrasive contact point over a larger area of the tool increasing tool life dramatically. A full size, full color flat panel display makes information easier to read and understand, allows display of more information, including graphics and pictures and generally makes the control simpler and easier to use. The QCore SuperControl has, as standard, a 1 Terabyte hard disk drive allowing storage at the control of tens or hundreds of thousands of part programs and allows the storage of very large programs such as those used for carving. The control can easily, efficiently and without pausing, process programs that are many gigabytes in size, and can process blocks of data at unequaled speeds, resulting in faster execution of these types of programs. Thermwood encloses its controls, including power supplies and servo drives, in a sealed, air conditioned cabinet keeping them cool, free from contamination which substantially improves reliability. Thermwood uses professional wiring practices in its control, labels and color codes all wires, labels major components inside the control cabinet to make finding them easy for service (changing a fuse for example), and supplies complete blueprints of wiring inside the control. Advanced Support Program - Since Thermwood designs its own control, it can tailor new features so that they can be easily added to existing controls. This keeps you competitive as control technology advances. Thermwood offers an Advanced Support Program which provides automatic software updates each year, continuing Virtual Service and discounts on hardware upgrades and other service products. Thermwood builds both the machine and the control. Should you have a problem it is Thermwood and no one else responsible for fixing it. Most existing Thermwood CNC controls can be upgraded to the new QCore SuperControl. This allows existing Thermwood CNC routers to benefit from advancing next generation technology at a relatively low cost without requiring that the entire control be replaced. 91000 SuperControls and early QCore SuperControls can generally be updated rather quickly and easily. Please check with Thermwood’s Technical Service for more information on upgrading your existing Thermwood machine.